Despite the heat, the children race around just like children everywhere. These girls play rope-jumping before school, and can jump it at incredible heights by flicking it with their toes and then twisting over it like a cartoon contortionist. 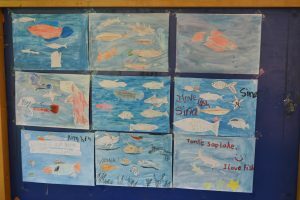 I’ve been more ambitious with my art teaching, and we progressed to paints this week to produce pictures of the fish in Tonle Sap lake. 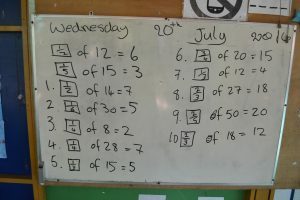 and while I’m fairly sure I got them all right (there’s no answer book!) I’m a bit hazy on explaining how to do it. Luckily if I tell them their answer’s wrong, they just accept it and don’t ask why. One of the brightest little boys in the morning class arrived with his head shaved on Monday. This is the tradition when there’s a death in the family, and he explained that his 21 year-old brother was killed on his motorbike last week, when a car ran into the back of him. I don’t know whether he was wearing a helmet or not, but a lot of them don’t. This little chap has now taken to sitting with James, one of the American students visiting this week, so perhaps feels that James is a substitute older brother. As the school was set up by a British couple, they have a child protection policy, which is apparently quite unusual over here. They gave me a copy to sign, but it was rather difficult to decipher as it’s been produced by someone who obviously thinks that using the space bar is an unnecessary indulgence. I’m starting to learn a few words of Khmer, and it’s a salutary lesson for a language teacher, as we can sometimes be a bit hard on kids who have trouble with pronunciation. I wanted to learn a few essential phrases, like ‘be quiet’, ‘sit down’ and ‘don’t be silly’, particularly for use with the afternoon class, and some of the sounds are very difficult. I can’t hear exactly what sound they’re making, and when I think I’m imitating them exactly, they howl with laughter at my mispronunciation. One sound, which is like half a swallow right in the back of the throat, is totally impossible and I’ve given up on it, because it makes me look and sound like someone who’s just accidentally swallowed a gobstopper.